Are you tired of the price of hotel rooms making weekend getaways too expensive for your budget? The answer to your money problems might be sitting in your driveway–your minivan. A minivan can easily be converted into a comfy camper for two. You can park it not just in campgrounds, but in free spots like rest areas, Walmart, BLM land, National Forest land and more. Here are ten essential items for building a minivan camper that can make your next road trip possible on the smallest of budgets. Bottled water will work fine for drinking purposes, but chances are when you go camping you are going to want water for a few more uses other than drinking, such as washing dishes, brushing teeth and washing up a bit. We decided to buy a 2-gallon beverage container with a spout. It is similar to this one, but ours is the Coleman brand. Since we only camp for 2 to 3 days maximum, bring along a case of water bottles for drinking and use paper plates and bowls, 2-gallons is adequate for us. If you camp for longer you will probably want something larger. Another tri-fold mattress goes next to this one making sleeping room for two. 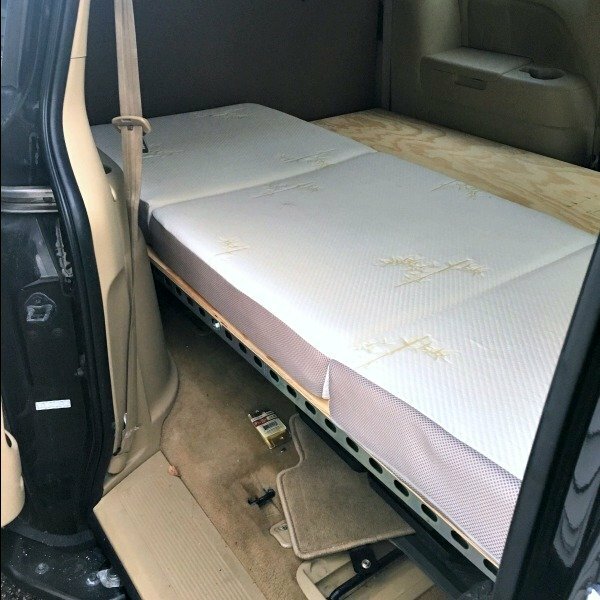 In general, the back of a minivan fits a full-sized (also known as double) mattress perfectly. We have a Honda Odyssey and we use two of these super single tri-fold mattresses side by side–they work great. We could have got the double size, but we find the two small ones are easier to get in and out of the van and easier to store. 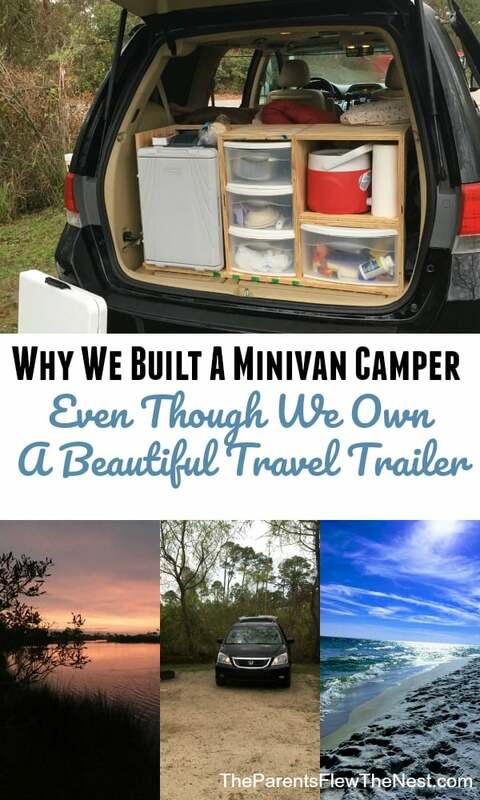 That was important to us since our minivan camper has to come apart after our travels so that it can be once again used for hauling people to and from places. Another bonus of them being so portable is that they can quickly be brought out for overnight guests when you are at home. If you don’t want guests to be sleeping directly on the floor, they fit well on a basic sleeping cot like this one. In fact, I have seen some minivan sleeping setups for just one person using a cot with a foam mattress on top for more comfort. By doing so, you gain a lot of storage under the bed and the setup is super simple to pack up and put away when you are done camping. And if you find the minivan camper a bit stuffy on a hot night, you can drag the mattresses out and place them in a tent (we haven’t done this yet, but we do travel with a small tent just in case). Both my husband and I find these tri-fold mattresses to be super comfy. We are impressed by their quality. My husband cutting the first window covering for the minivan camper. So far we have tried two different types of window coverings, and I think in the end we will use a combination of both. First we tried black blackout curtains that were clipped to a rope sideways using small binder clips. This was a very last minute, “Oh my goodness, we forgot about curtains,” idea we had on our first trip in our minivan camper. We strung the rope through the handles that you find around the top of the side walls of most minivans. It worked, but curtains hang straight down and minivan walls are curved so we lost a fair amount of indoor space to the curtains. 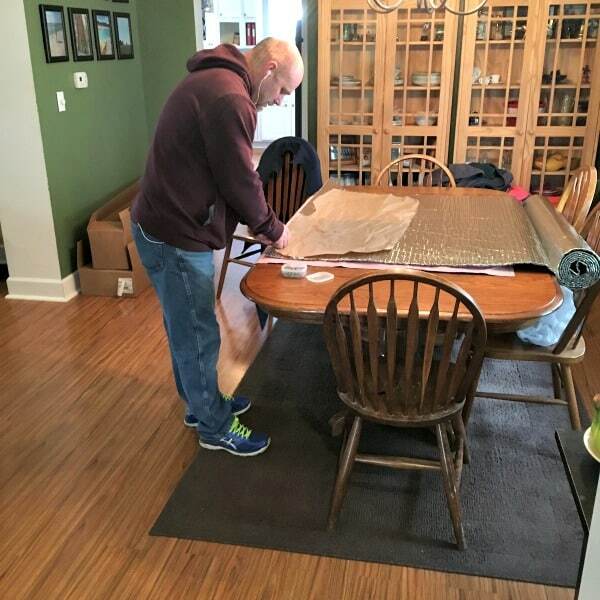 Once we had all the supplies gathered, my husband used the kraft paper to trace each window in our van to make templates for the Reflectix. To keep the paper from moving, Jack placed a few pieces of masking tape here and there as needed on the window and paper. He then cut out the templates and used them to cut the Reflectix to size. After that, he cut a piece of fabric using the paper templates as a pattern but cutting the fabric roughly one inch bigger than the template all around. He used the spray adhesive to glue the fabric to one side of the Reflextic (the side that faces out of the van) and then trimmed the excess material off. The last step was applying duct tape around all the edges of the window coverings so that it was half on one side and half on the other. The window coverings stick to the interior side of the van’s windows like magic. Well, not quite magic–it does take a bit of fiddling to get them in exactly the right place–but once they are in, they stay in really well. The only one that tends to slip a little in the night is the one covering the front windshield. That windshield in our Honda is massive and doesn’t seem to fit mass produced windshield sun covers so we were hoping our homemade one would work and it does–sort of. 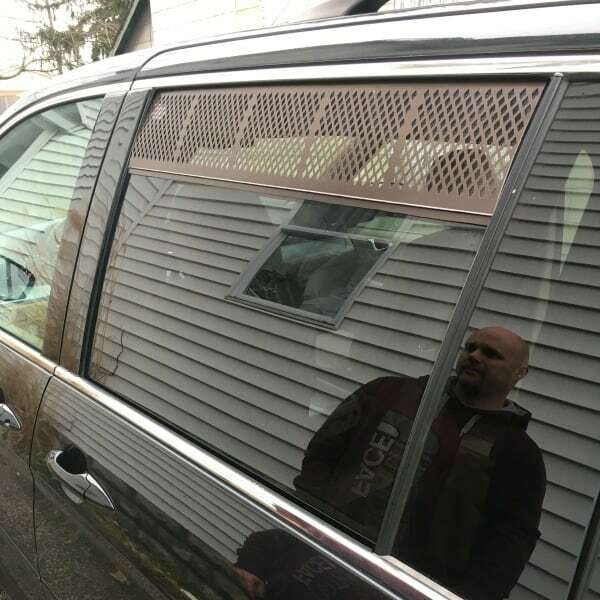 I think this minivan camper season we might try doing curtains behind the front seats and then our window coverings on the rest of the windows. In that particular spot, the curved walls of the van won’t make the curtains hang in our way, but we may be facing gaps around the edges–we will figure out something to fix that eventually too. After this picture was taken, we took the screening out and spray painted it black to match the tinted windows better. You are going to want some way to circulate fresh air through the minivan camper while you are sleeping. If you don’t, you are going to get a lot of condensation build up in the interior of your van which could lead to nasty issues like mildew. Of course, fresh air means opening a window, and opening a window makes a way for the mosquitoes to come in. Our solution to this problem was to buy a pair of these car window screens. They are a bit short for the front windows of our van, but they do allow us to leave the front windows down several inches. They are a well made and inexpensive fix. I am thinking of seeing if I can somehow sew an extension on to them so that we can leave our windows fully open. Another thing we did was cut plastic snap-in gutter guards to fit the windows on the sliding doors of our van. Ours roll down and are relatively straight compared to the curved front windows. We spray painted them the same color as our van. Both edges of gutter guards have a small groove that our window fits in perfectly. We get them on and then slowly roll up the window. It does take a bit of work to get them in place, but when they are in place, they work beautifully letting air in and keeping the bugs out. We are currently trying to think of the best way to make a covering for our moonroof as well as this seems to be the best window to keep open a bit if we are camping in a Walmart parking lot or rest area since no can see that it is open unless they jump on top or our van. My husband has a few ideas of how to do this, but we haven’t agreed on which one to try first. Bring whatever bedding you sleep best under. For us, we like our bed set up as close to the one we sleep on at home as possible. That means no sleeping bags for us. We like a down comforter and a set of sheets. We bring the pillows off our bed at home. If the weather is hot, we sleep with just a top sheet and a crocheted blanket I got at a yard sale for $0.50. We also bought a small USB rechargeable fan to help circulate the air. If the weather is cold we find sleeping with a sock hat (called a toque if you are Canadian) and socks on helps keep you warm. I got this tip from another minivan camper, but have yet to try it–purchase hand warmers and just before you got to sleep activate them and place them in your bed so it is warm when you climb in. You could even sew in pockets for them on your fitted sheets so that they stay right where you want them all night. This is what our minivan camper kitchen looked during our trip to Blackwater Falls State Park area. Unless you are eating out the entire weekend and you are purchasing all your beverages already chilled, chances are you want a way to keep food cold when you camp. We bought this 12-volt iceless cooler, but now that we have gone out camping a few times I wish we would have just bought a traditional cooler that requires only ice. Why? Because when we are not driving, the cooler is not getting the power it needs to keep the food cold. To fix this problem, we need to come up with another way to power it when we are not near a power source and that is only going to cost us more money. 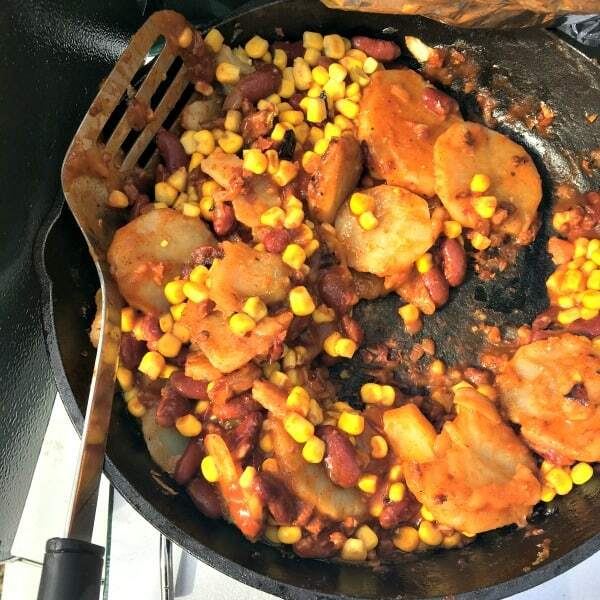 Our first meal cooked on our Coleman stove. We bought a classic two burner camp stove that runs on propane. There are, however, a lot of different options out there. Which one is right for you? That depends on how much you plan to cook at one time and what you plan to cook. One additional thing to think about is where you are going to store it. 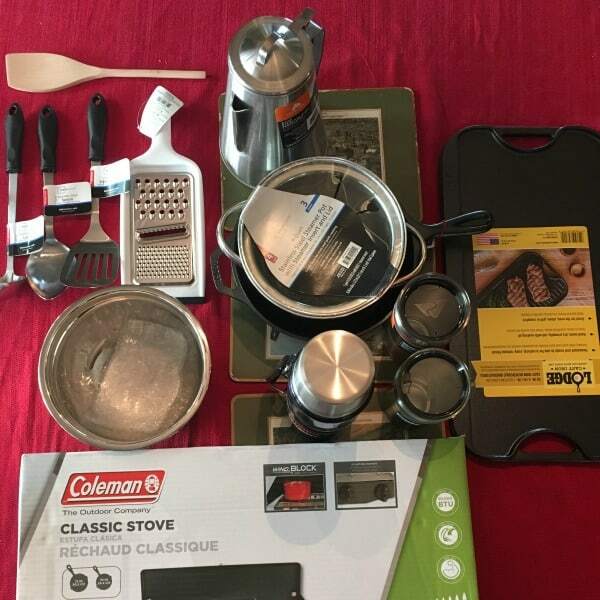 The basic supplies we bought for our minivan camper kitchen. After two trips we already decided we don’t need the kettle or the metal serving spoon. And the thermos we purchased for milk is much bigger than we need for weekend trips. 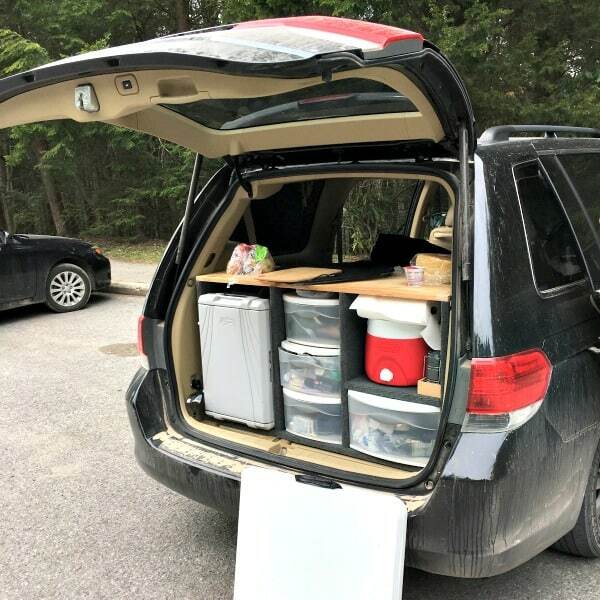 In a minivan to camper conversion there are usually two places to build in storage. One is under the bed and the other is in the trunk area. We have room in both areas, yet we seem to struggle to get everything we want to bring for the weekend to fit. We have only been out on two trips with our van so far, but we are quickly learning that we tend to bring way too much and we are not using the storage areas we have as efficiently as possible. Here is what we do know so far about storage: you need a defined space for everything and you need to keep those things in their spots when not in use because in such a small space, things become a mess fast! The second thing we know is that each time you head out you are going to figure out a better way to store items than you did the last time so don’t spend a fortune on organizing supplies. Try to use what you have until you are 100% sure you know exactly what you need to bring and how to best store it in the van. This table is so handy when we camp on National Forest land where there are no picnic tables. Make sure to bring along a large-sized cutting board that you can plunk down on a picnic table and use as a clean surface to prepare your meals. You also might want to bring a vinyl tablecloth to place between your cutting board and the public picnic table if you don’t like the idea of putting your cutting board directly on a surface that has been used for who knows what. 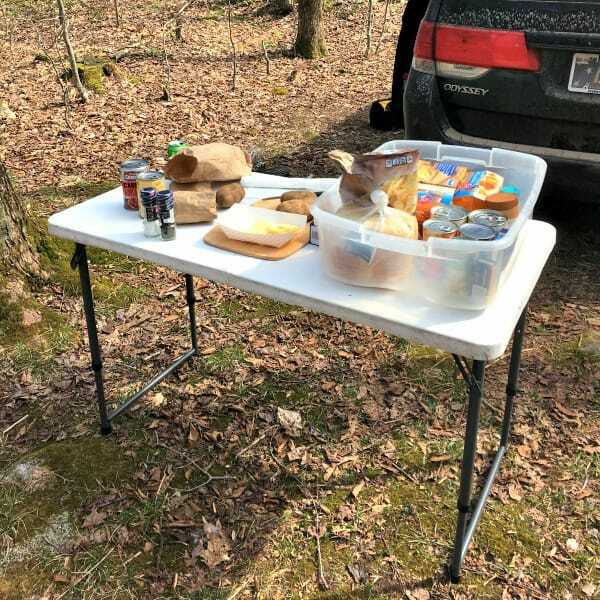 Of course, some places might not have a picnic table so make sure to pack along a table that can fit both your camp stove and your cutting board. We bring a folding camp table that adjusts to 3 different heights. It fits between our trunk kitchen and the trunk door of our van and stays put when we open the trunk thanks to a bungee cord. Currently we don’t have any source of power when we minivan camp except for when we are driving. When driving, the 12-volt outlet in the back of our van powers our iceless cooler and the outlets in the front of the van charge our phones. However, we are thinking of purchasing a portable power station to power the fridge during the night and other times when we are not driving. 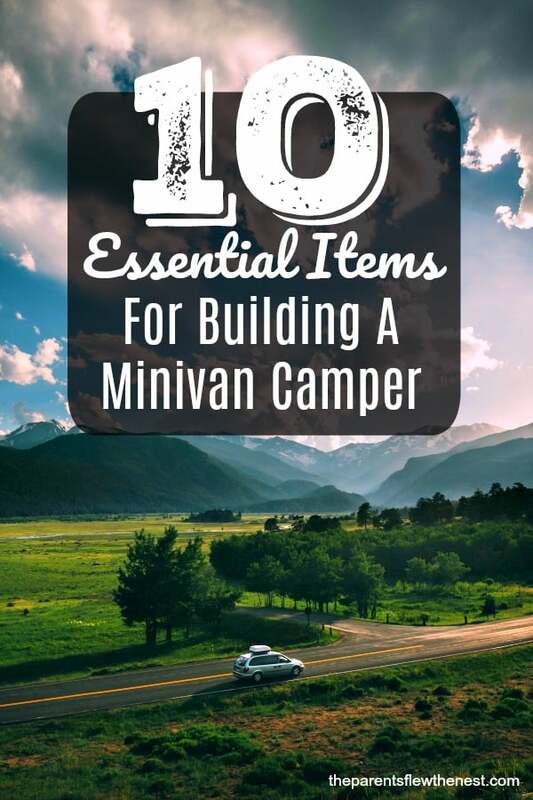 These ten items make up the bulk of what you need to think about when building your minivan camper, but they are not all the items you are going to need. You will also need to think about things such as what you want to use as a light source at night. We bought these lanterns and are happy with the soft, yet bright light they provide. Do you want to bring along camping chairs? If so, where will you store them? What items do you need to prepare your food? How many personal hygiene items do you need to bring? And how and where will you store them? What activities are you planning to do during the day? If you need supplies for those activities where will you store them? What clothing do you need to bring? 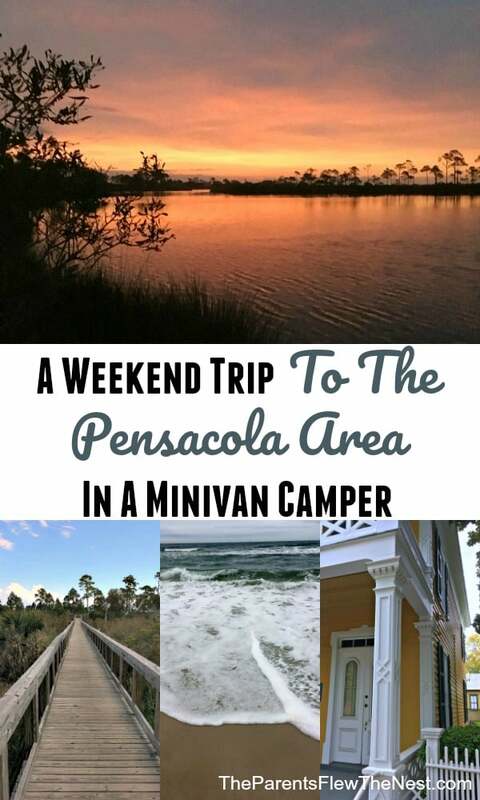 Read about how our first trip in our minivan camper.